So, boys and girls, what are your memories of Christmas Past? Life was a little more simple then, compared to today, far less commercialised, and, since the shops shut for at least a week, stocking up on food and drink was imperative! 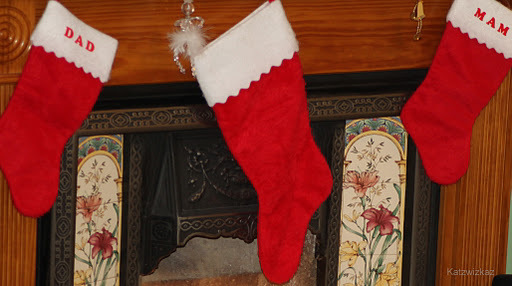 Santa visited our house for quite a few years when we were children. Off down the stairs, we would propel ourselves, at some unearthly hour on Christmas Morning, each encouraging the other to open the “magic” sitting-room door, just to see if “HE HAD BEEN”. And, of course, he always had! The squeals of delight from us may have woken up our neighbours, but, as kids, we did not care! Scalextric cars and tracks, sewing boxes, bead kits, jewellery boxes, Etchasketch, Spyrograph, watches books, pens, pencils, and outfits for Barbie, (I didn’t want Sindy stuff, Dad brought Barbie back from the U.S!) that was all we wanted. But Santa was always full of surprises and usually left a few extra presents too. As for our festive dinner, well, that was started very early on Christmas Day. Mam had it all under control, and, with precision timing, the meal would be presented as darkness decended outside. 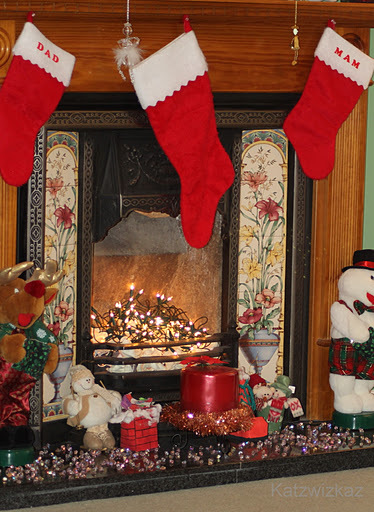 Our own fireplace has played host to Santa for quite a long time now too. Babs turned out just like me, and tried her best to get up at the very same unearthly hour as I used to do, just to check if the Big Man had visited. But she as she is an adult now, Santa still manages to wave at us, as he passes our house, on his merry way to visit the little ones around and about. We always wave back, as he flies by, on his very busiest of nights! So, wherever you are, and whoever you are spending Christmas and the Holidays with, I wish you all the very best of times, and don’t forget to put out a mince pie and glass of milk for Santa, and a carrot or two, for Rudolf, and Dancer, and Prancer, and Donner, and Blitzen……! You just never know! Enjoy, and I wish each and every one of you a very Happy Christmas, and Holiday Season, and very best wishes for 2012. Світлого Різдва та щасливого ового Року! Selamat Natal & tahun baru bahagia! Nollaig Shona, mo chairde go léir! I remember my sister waking everybody up at 5:00 AM. Then my dad would get up and go to the living room where he would turn on the tree and set up his video camera lights. Those lights were so bright the airport could borrow them and land airplanes in the night. Then we would all go to the living room and open our presents as soon as our eyes adjusted to the bright camera light. Merry Christmas to you and your family! Happy Christmas to you, J and R! Have a wonderful day! Thank you Margaret. Hope you and A have a lovely Christmas. Polish children just have to wait till the end of supper on Christmas Eve, because it is when the Santa or Gwiazdor or Angel (depending on the region) is coming. Thank you Collete, yes I had very nice Christmas. I even managed to write a little bit more about traditions.